Established in 1982, Globestock is a leading UK manufacturer of fall arrest, rescue, confined space and load protection safety equipment. Globestock supplies safety equipment to a wide range of industries worldwide, including mine rescue, fire and rescue services, utilities, training and theatrical. The G-Range of personnel protective safety equipment consists of the G-Stop fall arrest unit and the G-Saver II fall arrest and retrieval tool. 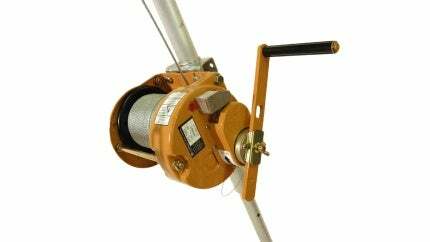 The G-Saver II incorporates a two-way emergency recovery winch, the G-Winch, for personnel lowering and lifting. The G-Tripod and G-Davit temporary personnel anchor devices are designed to provide secure, stable anchorage for working in confined space and on down-hole applications. Fall arrest and recovery rescue products can be supplied with 7m to 34m of steel wire safety line and up to 50m for personnel lowering and lifting. Brackets are available to safely secure the fall arrest and winching products to the G-Tripod and G-Davit. The G-Guard range of load arrest safety equipment is a retractable fall arrest safety line developed to reduce the risk of injury to personnel and damage to sensitive equipment, as a result of a failure in the primary support. A range of CE models are available, with some having working rope lengths of up to 24m. Industrial load arresters are a key safety feature in industries such as lifting, material handling, automation, automotive, nuclear and theatrical. G-Guard is a retractable, tensioned safety line designed to protect machinery, high value and sensitive loads from falling.